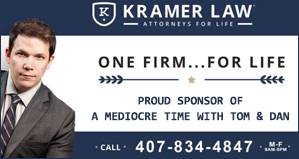 This is one of the most exciting things that we’ve done in the history of the podcast – “A Mediocre Time with Tom and Dan” is the first podcast in the history of Halloween Horror Nights to be an official media partner! We’re SO stoked about this milestone and you can really help us out with this one! We know that a great deal of you guys already plan on getting tickets (I know that I’ll be there!) 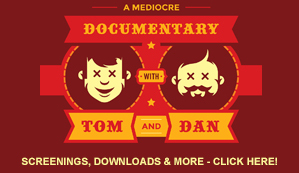 and you can do so by using the OFFICIAL “A Mediocre Time with Tom and Dan” ticket link. Tom and I also got to do something that I’m almost certain has never been done before; we got a full “lights on” tour of the “Jack Presents: 25 Years of Monsters and Mayhem” maze that will be debuting at this year’s event! Don’t worry, we don’t give away much – or do we? Friend of the show and fellow BDM Member, Mike Aiello – Director of Entertainment and Creative Development for Universal Orlando, gives AMT listeners a crash course of who he is. And if that wasn’t enough we also give you a personal tour of one of the greatest, if not the greatest, “HHN Icon’s” new 2015 maze. Like we said, we could not be more proud to have Universal Orlando as a partner this year and we think that you’ll really love the show!